The 2019 Purdy High School Homecoming court is pictured, from left to right: freshmen Areli Garcia and Bentley Stephens; juniors Soledad Salas and Scotty Henry; kindergarten escorts Charlie Cornelius and Madison Robbins; queen Isbell Ibarra and Mr. Tip-Off Mason Schallert; and sophomores Kinsley Mattingly and Jacob Brown. Photo courtesy of Rhonda Mattingly. One of the 2019 Purdy High School Athletic Hall of Fame inductee Brian Lyons (left) joined his PHS cross country coach Steve Johnson (right) for a photo opportunity on February 1. The Purdy High School Student Council hosted its annual Homecoming week festivities Monday, January 28, through Friday, February 1. This year’s theme was “We Love the ‘80s.” Special dress-up days included: Fake an Injury Day, Twinsies Day and 80’s Day. On Friday, the council held a special assembly to announce the 2019 Mr. Tip-Off. Candidates included: freshman Bentley Stephens, son of Jamie and Justin Roller and Mike and Shana Stephens; sophomore Jacob Brown, son of Darcy and Jason Brown; junior Scotty Henry, son of Brett and Deanna Henry; and senior Mason Schallert, son of Todd and Tracy Schallert. After the student body enjoyed a variety of spirited games, Schallert was crowned Mr. Tip-Off. The 2019 Purdy High School Homecoming coronation was held between JV and varsity boys’ basketball games against Crane. Mr. Tip-Off Mason Schallert crowned senior Isbell Ibarra in the packed gymnasium. Ibarra’s attendants included: freshman Areli Garcia, daughter of Max Mendez and Lilliana Mendez; sophomore Kinsley Mattingly, daughter of Jim and Rhonda Mattingly; and junior Soledad Salas, daughter of Tomasa and Jose Luis Salas. The royal court was led by kindergarten escorts Madison Robbins, daughter of Cecil and Jennifer Robbins; and Charlie Cornelius, son of Rusty and Jennifer Cornelius. Prior to the coronation, the Purdy High School Athletic Hall of Fame inducted 1990s cross country champion Brian Lyons and the 1981 Girls’ Basketball State Championship Team to its ranks. Legendary coach and hall member Mike Payne presented inductees with commemorative plaques and offered a warm welcome to the Hall of Fame family. After soaring to the State cross country meet all four years of his PHS running career, Brian joined the Missouri Southern State University Track and Cross Country team as a walk-on, joining a very competitive group of runners. His college accolades included team captain, MIAA Conference Champion and All-American. Brian led the Lions to four conference championships. During his time at Missouri Southern, Brian met his wife, Margaret, a standout athlete on the MSSU women’s track and cross country team. Brian and Margaret were inducted into the MSSU Athletics Hall of Fame in 2014. Upon college graduation, Brian joined the running industry as a career leader, producing and providing support for running events across the United States and working to help others succeed in the business. He has also completed seven marathons and several half marathons. 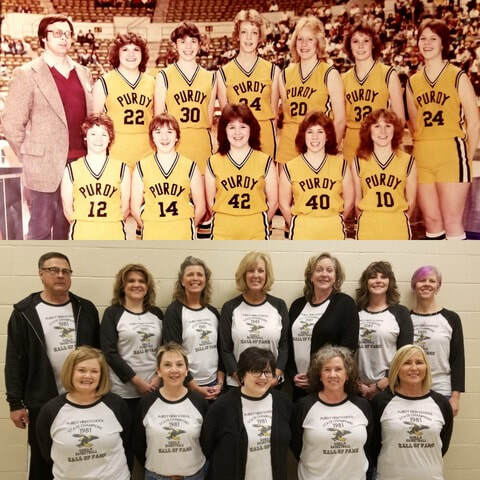 The Purdy Lady Eagles basketball team made school history in 1981 by bringing home the Class 1-A State Championship after earning a fourth place finish and the State Sportsmanship Trophy in 1980. Coach Bill Reece and his team returned to the Final Four in 1982, placing second in the state. The early '80s lady eagles were a local basketball dynasty, igniting the spirit of the eagle within staff, students and the Purdy community as a whole. In the years after their high school graduation and continuing into their adult lives, the members of the 1981 Purdy Lady Eagles basketball team continued to bleed black and gold, supporting their alma mater in a variety of ways and continuing to inspire young Lady Eagles to dream, work hard and proudly represent their beloved school both on and off the basketball court. When the 2011 Lady Eagles basketball team advanced to the Final Four, the 1981 ladies were there at the send-off assembly and at the tournament, cheering on their protégés who grew up hearing the stories of the legendary 1981 Purdy Lady Eagles State Championship Team. Lyons and the ’81 team joined existing members Norman “Gabby” Gibbons, Earl Miller, Becky Fly Woods, Mike Payne, Megan Leonard, Brenda Keeling McNeil and Nancy Easter. The evening’s attendees enjoyed perusing a memorabilia exhibit, featuring photos, medals, trophies, letter jackets and plaques from the Hall’s newest members. Reunited. The 1981 PHS State Basketball Championship Team recreated their victory pose at the ceremony on February 1. Teammates are pictured from left to right. Front row: DeAnna England Crossland, Becky Fly Woods, Mary Bennett Hall, Traci Hansen Smith and Catherine Richter. Back row: coach Bill Reece, Sherri Veith Brooks, Janice Saville Courdin, Dixie Williams Henry, Brenda Keeling McNeil, Melinda Hayes Chapman and Caren Corbett Gioannini.